When the Start Your Engines! DVD trailer was revealed, I wrote a post (now removed) about my initial thoughts on this little boxcab. But now that I've seen his two episodes and The Great Race, I think it's time to see just how much my opinion on little Philip has changed! 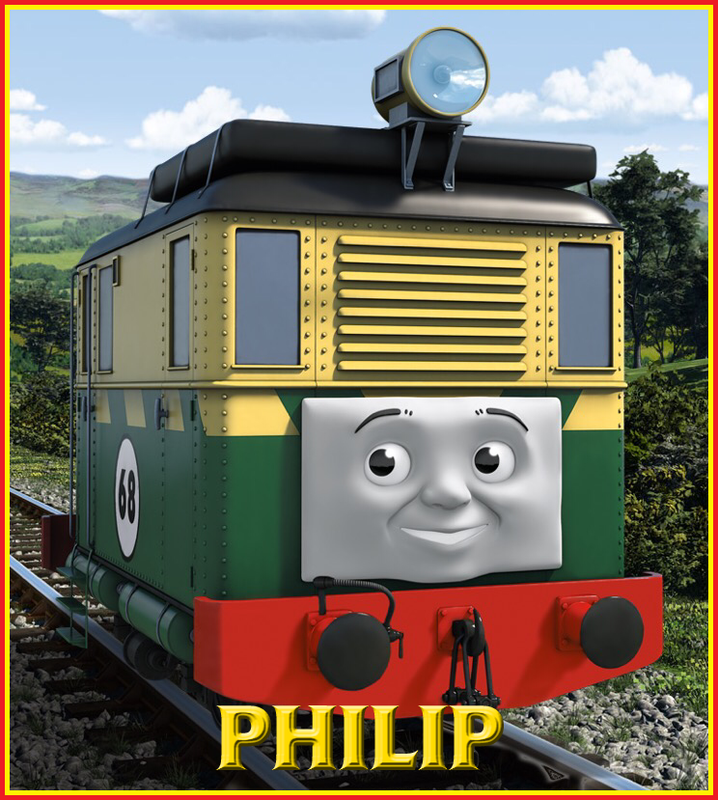 In the old post, I praised Philip for being a diesel shunter that looked a bit different, and considering there were three new class 08s seen in The Gtrat Race, that opinion has only strengthened. Yes, class 08s were in abundance on BR's books back in the day, and there are still quite a few around today, but it's becoming tedious for the writers to rely on them when thinking of new diesel shunters for the show. So seeing a little boxcab like Philip is a breath of fresh air, even if the show would benefit more with a couple of larger diesels here and there. Another aspect that I praised was his voice and, again, I still believe that it's very fitting for the kind of character Philip is. Rasmus Hardinker does an excellent job bringing out Philip's childlike wonder and excitement in his voice in the same way the animators do a great job bringing that out visually. However, the poor little guy came crashing down with The Little Engine who Raced Ahead, where he spends the majority annoying Gordon (and the audience) whist the other engines just appease his whims because... he's a childlike character? It's like I said in the review of this episode; Philip seems to have been based on the average child from this generation: one that still has a wonder about them, but they seem much more "in your face" due to lack of discipline or consequence for their actions. Granted, he was called out for being unsafe, something he took to heart, but his other traits remained the same. His attitude didn't improve in Philip to the Rescue either. I'm not going to say that he was fully responsible for the accident that took place, as James should have known better than to let a little engine get to him after 32 years. However, I will say that he was a major catalyst for James' actions due to his annoying temperament. Had he been taught better, he would have mellowed out by the time this episode came around. And then The Great Race came around. And, while I don't necessarily forgive his personality in his episodes, it made me realise exactly what the problem was: he has been written terribly throughout the show, as if Andrew Brenner doesn't really understand childlike characters (and, considering he played a huge part in The Cramp Twins, it's not a far-fetched assumption). Yes, he did a great job with Thomas in The Adventure Begins, but you can't really go wrong when you have the source material at your disposal. So in TGR, Philip makes snide remarks about Ashima saying "she'll be trouble" - although, in fairness, some kids do end up making remarks when it comes to new (or existing) friends and family. This is resolved when she helps him against Vinnie, which was some nice, subtle development. I also quite liked that the one time his "race" against Gordon was brought up, Percy remarks that Gordon didn't actually race, forcing him to get defensive. It feels very childlike without feeling too annoying, which is something that would have hugely benefited his episodes. But... his positive developments are completely stifled by his confrontation with Vinnie. I won't go into too much detail with the climax of that little screw up, and the unfortunate implications that came from it, because I've already written a post about that. However, I will state that, throughout the story, the only reason Vinnie goes after him is because he accidentally gets in the way. And I mean legitimate accidents. And the sad thing is that he doesn't retaliate. Like I've said, I get the fear, but I think the overall moral would have been stronger if he'd have stood up for himself before he was helped out. I think these posts on characters on TGR are interesting, and don't worry about spoilers. I still yet to know the whole story once I watch the film so I can wait till Aug or Sept or whenever. As a US citizen, I'm still looking forward to this movie, though Ashima and Big City Engine are the only newcomers that intrigue me so far (just saying because was hardly in the S3 ep). I've listened to the songs and I enjoy them, though they might be catchier once the pitch is adjusted. Oops my bad. Anyway, yeah, so Ashima and Flying Scotsman are the only two that intrigue me so far. My problem with Philip is that due to being the only American diesel, he doesn't really fit in compared to the others. Sure there are many Class 08s on the show, and they wanted to change that, but there are other BR diesels like Class 01s, Class 02s or Class 05s to use. To be honest, the American locos and Hiro don't fit at all, despite how many alterations they give them. Porter is the closest to fitting in. I'm not saying they shouldn't have foreign engines on the show, but I would like them to pick classes that would fit the best. That's why Porter and Timothy work so good. They feel like UK locos with those alterations. I think he fits in really well, to be honest. Porter's so shrunken down that his buffers are really low and you'd have to be a stick figure to get into his cab. But Philip's proportions just look right to me.